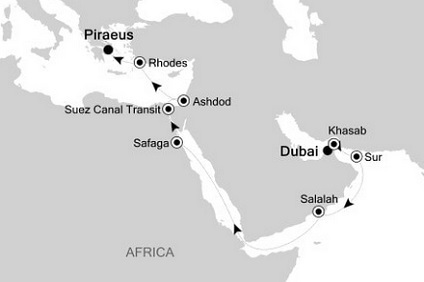 Long heralded as the defining crossing between Asia and Europe, the Suez Canal is a must for any savvy traveller. This is a journey that keeps the beauty of time on its side. Days at sea are punctuated with lush vegetation and vast sways of arid desert, while a full-day trip to the Valley of the Kings is another bucket list boxed ticked. From the modern to the ancient, be prepared to be fascinated. Dubai sits on a golden sandy coastline in the Arabian Gulf, where the warm azure waves of the sea meet the desert. A high-rise oasis, this city is a pleasure-dome surrounded by dunes; one of the most fashionable on the planet thanks to its ability to satisfy the needs of legions of demanding vacationers. Dubai is about having fun—and it's one big adult playground. Nature plays her part here, with year-round sunshine, gorgeous beaches, dramatic arid landscapes, and warm waters, but it's the man-made attractions that make Dubai so alluring. You can launch yourself into high-adrenaline desert adventures, diving and water sports, and some of the world's best golf courses. The lush landscape around Salalah is the intriguing result of a quirk of nature. Since it is uniquely situated in the path of the Khareef, or South Western Monsoon, this stretch of the Dhofar Coast is covered in fine mist and frequent rain from mid-June through mid-September. By the time the monsoons cease, the entire coastline is a verdant stretch. Waterfalls, rolling grasslands, and thickly wooded wadis (riverbeds) thrive alongside rapid mountain streams. Unique in this desert region, Salalah attracts many visitors from the surrounding Arabian Gulf countries who are anxious to experience a rare lushness in a region where rain and greenery are in short supply. Early travelers described Rhodes as a town of two parts: a castle or high town (Collachium) and a lower city. Today Rhodes town—sometimes referred to as Ródos town—is still a city of two parts: the Old Town, a UNESCO World Heritage site that incorporates the high town and lower city, and the modern metropolis, or New Town, spreading away from the walls that encircle the Old Town. The narrow streets of the Old Town are for the most part closed to cars and are lined with Orthodox and Catholic churches, Turkish houses (some of which follow the ancient orthogonal plan), and medieval public buildings with exterior staircases and facades elegantly constructed of well-cut limestone from Lindos. It's no wonder that all roads lead to the fascinating and maddening metropolis of Athens. Lift your eyes 200 feet above the city to the Parthenon, its honey-color marble columns rising from a massive limestone base, and you behold architectural perfection that has not been surpassed in 2,500 years. But, today, this shrine of classical form dominates a 21st-century boomtown. To experience Athens—Athína in Greek—fully is to understand the essence of Greece: ancient monuments surviving in a sea of cement, startling beauty amid the squalor, tradition juxtaposed with modernity. Locals depend on humor and flexibility to deal with the chaos; you should do the same. The rewards are immense.